I'm delighted to be able to show two maps that appear in Total War Rome: Destroy Carthage, produced by my publisher Macmillan. The first one is a superb topographical map of the Mediterranean region showing the main settings of the novel - Rome, Macedonia, Spain and North Africa. 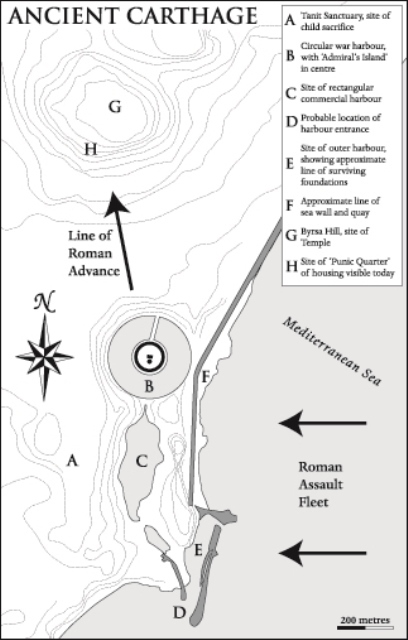 The second is a plan of ancient Carthage showing the direction of the final Roman assault in 146 BC, from the harbours and the sea wall towards the 'Byrsa' and its temple. One the way you can see places that figure in the novel - the Tanit sanctuary, where the Romans witness horrific scenes of child sacrifice, and the old Punic quarter beneath the Byrsa, scene of savage fighting as the Carthaginians made their last stand. Rather than being a hypothetical reconstruction of its appearance at the time, I wanted the harbour complex to appear as it does today, including offshore foundations examined by diving teams under my direction in 1993.